Hi there! My name is Andrew, a percussionist who has been playing for aboout 12 years now and also played the trombone during middle school! 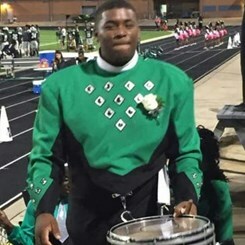 I graduated high school in 2015 from Hightower High School. During high school, I marched on cymbals for two years and then moved to snare drum as drum captain my Junior and Senior year. I am currently a music performance major at Texas Southern University and I look forward to helping you out!